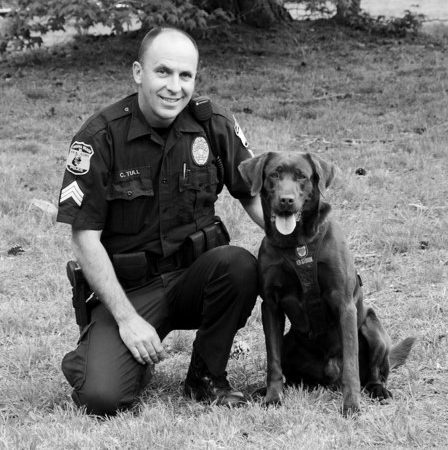 Chewie, a member of the Virginia Beach K-9 force with his handler Sgt. C. J. Tull. Service dogs like Chewie are normally obtained around the age of one and a half years old. After 10 to 12 weeks of training they are put into service and their normal tenure is seven years. This makes the dogs nine years old when they retire. The dogs work so hard during those first nine years of their life because of the strenuous physical activity they go through, that it was felt they earned the right to be retired after the age of nine. This way they can lead a normal life like any other dog. Sgt. Tull said, “they can lay on the couch and eat pizza with the rest of us”. Sometimes dogs like Chewie who have served with the military, are reunited with the handler they had in the military. This is done because the military handler wants the dog and requests to be reunited with him. In civilian life, the dog stays with only one handler on the K-9 force. If the officer retires and there are enough years left for the dog to serve, the dog will be trained for a new partner. In the case of Sgt. Tull who is retiring next December, Chewie will be retired at the same time. If a dog does continue to work, he is retrained to the new handler and, depending on the dog, this takes a few weeks. The dog’s new loyalty then becomes to the new partner. Sgt. Tull also had an interesting story to tell. He has done everything on the police force in his twenty-nine years of service. Before going into the K-9 division, his favorite duty was the vice squad where he did undercover work. He said it was “fun to have long hair, wear street clothes, and search for the bad guys.” He also worked at the Rifle Training Center in North Carolina for four years and was instrumental in developing new techniques of training in how to shoot, not necessarily to kill the suspect, but to stop them in their tracks. His discipline in any of these fields of service helped make him a good candidate to lead the K-9 Corp training of handlers. It was interesting to get an inside story on the lives of these dogs. They learn the difference between work and off-duty life. The dogs are normally kenneled outside in the handler’s backyard but periodically they come in to get out of the heat or cold or just visit with the family. “It’s up to the individual handler knowing the temperament of their partner.” After they reach the age of retirement, Sgt. Tull says they soon learn to be a “couch potato.” That sounds like what most of us look forward to.